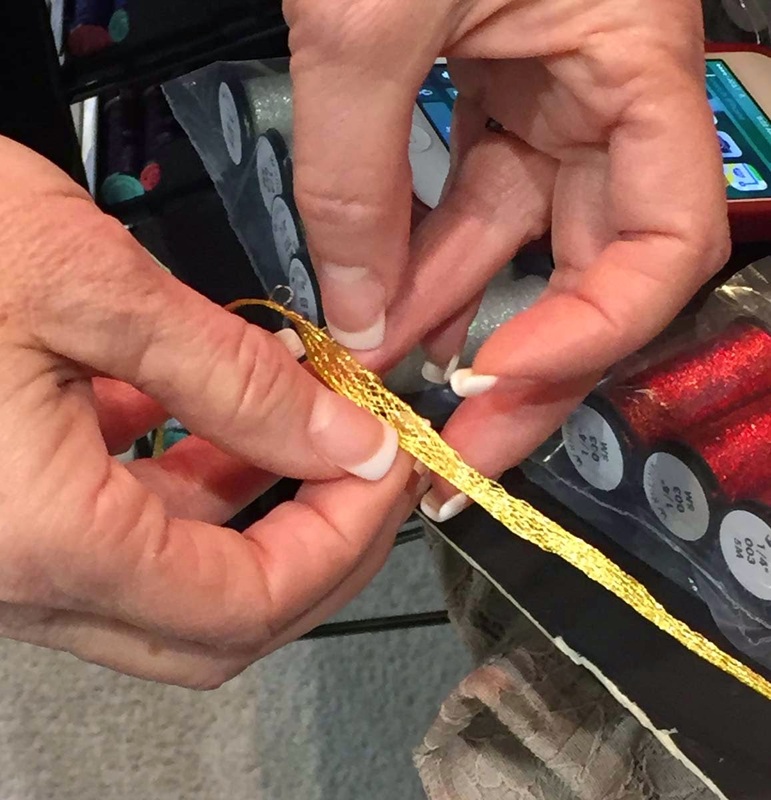 A few of our Kreinik staff members are heading to Nasvhille, Tennessee, later this week for a needlework trade show—that is, a buying event open only to wholesalers and licensed businesses. This is one of the ways needlework shops get new products in their stores so you can shop the latest designs, see threads first-hand, and discover new fabrics. We get to meet new designers, and network with amazing shop owners. A trade show is a lot of work, but also pretty fun. Our design/marketing department works on design ideas, stitching and writing to make sure the projects are pretty and easy. Sometimes we hire outside designers to create the projects, and sometimes we design them. We do the charting, instructions, photography, and package designing in-house. Janice and Rebecca in our customer service department keep things running smoothly, making sure all staff have their lists and whatever they need for the show order, manage all printing, plus handling the usual (and some unusual) daily orders, not-to-mention making sure we are already working on the next show (which is only four weeks away…). Brenda heads up our kitting department as well as our silk department, so this is a busy show for her. She will do the silk prep, cutting, winding, skeining, instruction folding, and packaging for the ten new kits (24 of each), the other kits we're bringing, plus daily orders. That's a lot of organizing, making, compiling, and producing in a short amount of time. Our production manager Rodney and his team keep our machines making Kreinik Braids, then labeling and packaging the spools or cones. In addition to making threads for daily orders, we will make extra stock to take to this cash-and-carry show. At Nashville, we will have three-rack assortments (that's five spools each of 162 colors) in Kreinik Blending Filament, Very Fine #4 Braid, and Fine #8 Braid. 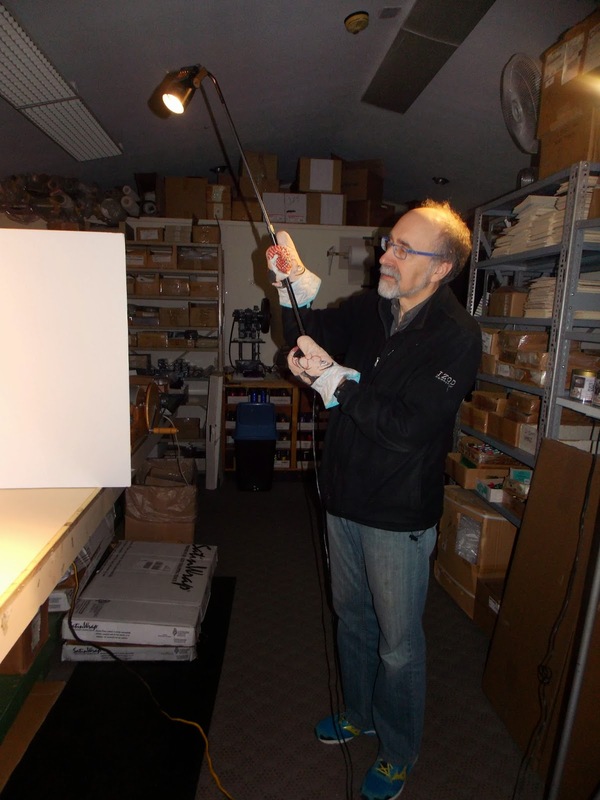 Our team puts the thread on the racks at the factory, so all we have to do at the show is unwrap the trays and hang up the racks (a huge timesaver on set-up day). There are certain machines dedicated to making the new Chevron Ribbon, designed to "braid" Kreinik base fibers into a chevron pattern in our 1/16" Ribbon size. We will bring plenty of spools of the five colors in this fun ribbon, which can be used for satin stitches, ribbon embroidery, crazy quilting, needlepoint, and any other surface embroidery stitch. There's so much going on behind the scenes of an industry trade show, but this gives you a glimpse. Big thanks to all of the Kreinik team members working hard on this show and on daily operations, and big thanks to you for buying Kreinik thread and making beautiful creations with it. Shop owners and designers going to the Nashville show, come see us! Kreinik will be in room 308. Visit http://www.needleworkretailer.com/nashville2015/index.htm for show registration information. Kreinik's newest metallic ribbon size has expanded by designers' requests with the addition of 002J Japan Gold, 001J Japan Silver, 321J Dark Japan Gold, and 021C Copper Cord colors. These are the classic embroidery colors most often used to resemble real metal thread work. Couch this ribbon for surface design, needlepoint, and other techniques, on fabric, canvas, or Congress Cloth. You can also spread the ribbon to create a "gauze-like" effect (see photos), then add beads or paillettes in the open areas. Due to the way we make the ribbon, with intertwining, braided fibers, it is flexible, strong, but also soft. 1/8" Ribbon has been a staple for years as an ideal weight for plastic canvas embroidery, but it's also used in crazy quilting, surface embroidery (couched, and used in special stitches). In needlepoint, use it on 14-mesh canvas. 1/4" Ribbon can be couched on any fabric or canvas, used in special stitches (use a large-eye needle), or twisted using the Kreinik Custom Corder for a weightier trim. 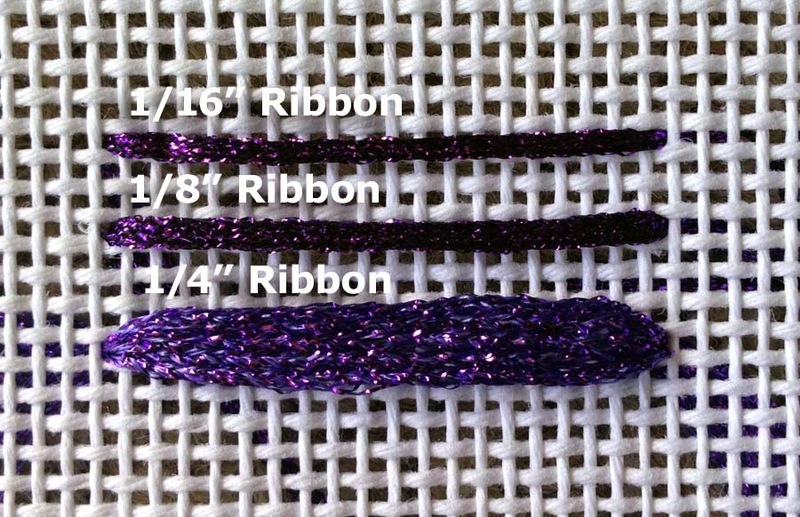 Ask your local needlework store for the new Kreinik 1/4" Ribbon, or visit http://www.kreinik.com/shops/1-4-Ribbon.html. Fiber artists, needleworkers, spinners, weavers, art quilters, knitters, crocheters...anyone who loves FIBER will want to pass through the Mid-Ohio Valley region this weekend for a rare opportunity: Saturday hours at the Kreinik Factory Store. Here's your chance to see, touch, feel and buy unique (some are one-of-a-kind) fibers for upcoming projects. The Kreinik Factory store is located at 1708 Gihon Rd. in Parkersburg, West Virginia. It will be open this Saturday, March 7, 2015,from 10 am to 2 pm. You will find items not carried by needlework stores, such as one-of-a-kind fibers, overstocks, discontinued threads, and embroidery kits. Artists, teachers, designers, makers, and stitchers are welcome. 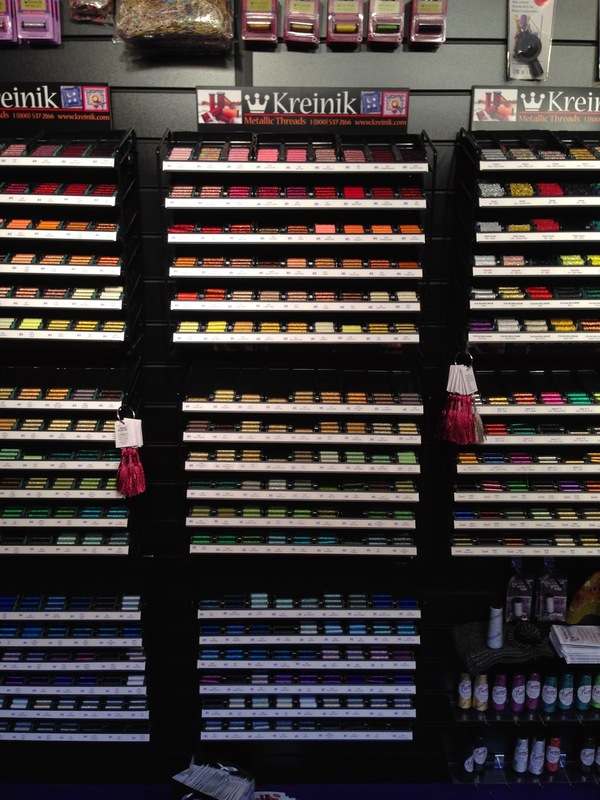 Kreinik is a family thread company manufacturing silk and metallic fibers for over 40 years. We are always excited to meet people and share our passion for textiles. See you Saturday!